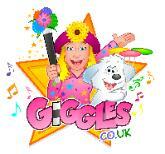 GIggles Parties for kids, party tips by Glasgow's leading female entertainer! Which Venue Home or Hall? your room beside a power point. How many children/adults should we invite? astonished when Giggles knows their name without asking. Get the kids involved in the party planning, particularly siblings. special, so ask them and let Giggles know! Do I need some adult help ? Remember the children are your responsibility during the party. How do you deal with a disruptive child ? What about a child that is shy? and should be encouraged but never pressured to participate. glued to mum for two of her friends "Giggles Birthday parties." Gemma ran up to welcome her with a huge giggle ! When will we have the Birthday Cake? Is there anything I should let Giggles know about ? insurmountable but forearmed is forewarned. matter how incidental prior to your event. inevitably bring out the Giggles in all of us!